Vlad is back, and this time he’s hungry. I mean, really hungry. I could explain the plot of this one, but I think I’m going to eat, instead. 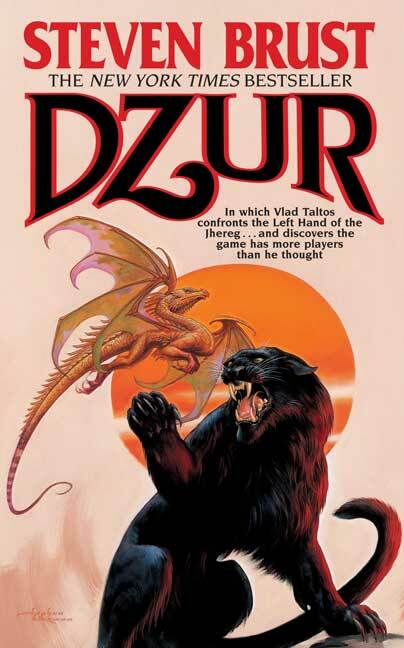 Of all the Vlad novels, this one hit me harder than any other. Just thinking about fine and noble cuisine is a sensual experience, so even in the abstract the details of of the meal before each chapter rendered me more vulnerable to the goings-on. Yet because the meal was abstract for me, I was able to maintain a distance from the narrative. So I saw more of the whole that led to each bit of action. I won’t even admit how many times I’ve tried to make essence of pepper. Being something of an amatuer cook myself, I was particularily struck by Vlad’s description of the symbiotic relationship between the cook & his audience in the Valabar’s portion of chapter 3 – Shamy. I’ve never heard (or read as the case may be) it put more succinctly & at the same time, eloquently. Kudos on an especially fine wee piece of prose. Definitely one of my favorites out of all of them. Issola might be my very favorite, but I’d probably have to read them all again to decide. I guess that shows a flair for the dramatic in me (loving the epic battle of Gods and Jeonine and Vlad and the reborn Teldra), but then, Taltosh is probably also in my top four out of all of your books that I’ve read. Anyway, I really love Dzur. Finally! A meal at Valabar’s! Is there a special place that gave you the inspiration for Valabar’s? There used to be a wonderful restaurant in Chicago called The Bakery, chef Lajos Szathmary. I still dream of it. In the climax, I initially had trouble believing that Vlad’s threats were credible, but of course they were, on several levels: he could destroy several people’s souls and assuming that Lady Caola and her cadre were the leadership, he could pretty much wreck the Left Hand. And of course, the Demon is there to make the threat more persuasive. Like I said, I may be overthinking it, but it’s still pretty cool. I love that your books have real food in them and not just stew.